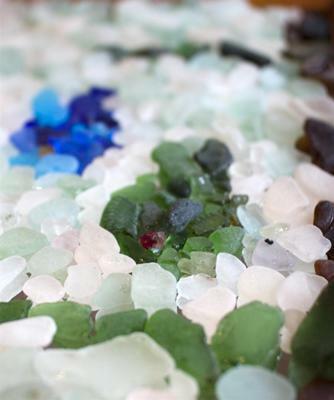 I've collected sea glass for years from beaches in Aberdeenshire, Scotland. I decided the other night to make a picture from some of the glass I had. Aberdeenshire is a council (similar to a county) that wraps around the city of Aberdeen on Scotland's northeast shore. Exposed to constant waves from the North Sea and with numerous bays and estuaries, Aberdeenshire provides a good coastline for sea glass exploration. On top of that, this area of Scotland has numerous archeological sites dating back to pre-Roman times, so who knows what might turn up on the beach. Here summers are mild and winters are cold and the days and nights may be closed in by fog. Of course, that doesn't deter sea glass fanatics, some of whom have even been known to be out looking for sea glass with snow on the beach, in the middle of storms, and even at night with a flashlight (not really recommended). We are looking forward to more reports from Scotland.